Though only CEOs may opt for the helicopter transfer to Davos, attending the WEF would make an accountant baulk. Editor's note: CNN is at Davos and will bring you breaking news, analysis and insight from January 20 to January 25. Join CNN's anchors Richard Quest, John Defterios and Nina dos Santos as they ask the world's political and economic leaders what we can expect in 2014. Follow our team on the ground here and see complete coverage here. (CNN) -- The great Davos talking shop is now up and running, with delegates of all levels of importance, shapes and nationalities zeroing in on this quaint, alpine town to put the world to rights. For many ordinary people the annual meeting of the World Economic Forum (WEF) is yet another "important" summit in the calendar where the elite of business and politics will schmooze for a few days in a rarefied environment they have little or no experience of. Whether or not you believe events such as Davos justify their lofty ambitions, they are certainly a unique experience. 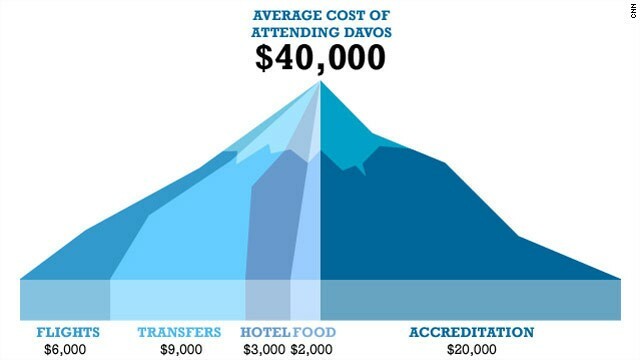 So how do you become a Davos delegate? The World Economic Forum is strictly by invitation only, with 2,500 participants representing over 100 countries. The roll call includes CEOs and representatives from the world's biggest corporations; politicians and heads of state from the G20 and other key countries; technology innovators; social entrepreneurs; philanthropists and media companies. Adding to the exclusivity is the hefty price tag to attend. While the white badges are free for invited representatives of certain groups -- heads of state, faith leaders, academics, social entrepreneurs, members of international organizations and news anchors -- for businesses, the cost of a ticket is approximately $20,000. Getting to this small ski resort, nestled in a picturesque valley high up in the Swiss Alps 150 km south-west of Zurich, is not for the budget traveler. For a delegate arriving from New York this week flying business class, the price comes in at between $4,800 and $7,200. A visitor from Tokyo can expect to pay between $4,500 and $8,300, while a delegate flying in from Johannesburg, South Africa will pay around $4,900. And once in Zurich there's the small matter of the transfer to Davos. A regular shuttle bus and train service is available, but a two-hour trip by public transport may not suit the business client. The alternative would be a limousine which would cost around $700 for a one-way trip. However corporate CEOs may choose to come by helicopter, which last year cost around $9,500 for a return flight. Finding accommodation in Davos during the week of the World Economic Forum is not easy, with a limited number of large hotels. Predictably tariffs reflect the resulting demand/supply imbalance, with a room in a modest three-star hotel coming in at around $600 per night. Those with a considerably bigger budget often choose to rent out whole apartments or chalets. A chalet sleeping up to ten people for the week can command as much as $60,000 - though catering might just be included. It's cold in Davos, very cold. At 5,052 ft (1,540m) above see level, temperatures average -6 degrees Celsius (21.1 degrees Fahrenheit) in January. Thermal underwear, winter jackets and snow boots are a must, particularly when the temperature plummets in the evenings as you make your way to the various cocktail parties, meals and social events hosted by partner companies. It is not uncommon to see $2,000 bespoke suits finished off with bulky snow boots around the Congress Center. For an outsider, the gathering in Davos might look like a big party for anyone who matters in the world. In reality, the meeting in Davos is ruled by a strict hierarchy. Access to some places is strictly for a a few dozens of heads of state, royalty, the CEOs of global corporate giants and the heads of a veritable alphabet soup of international organizations. How do you spot the very, very important people among the 2,500 delegates? Look for the badges. Anyone wearing a white badge is an official delegate, who got invited to the conference. Spouses of delegates and "strategic partners," who sponsor the WEF, have similar badges. The most exclusive badge, the kind that gets you access to the behind the scenes secret society (officially known as the Informal Gathering of World Economic Leaders), is the one with a holographic sticker. With all the above boxes ticked, it is essential to have a plan once you have run the gauntlet of airport-style security -- there are 4,000 Swiss troops in Davos this week -- and made it inside the newly-extended Congress Center with the correct color of identity pass. Some delegates do nothing but network with other delegates, oblivious to the feverish discussions going all around them about the post-crisis new reality. So delegates can spend four days roaming this cavernous indoor amphitheater attending conferences and workshops about everything from how the environment agenda will change in light of current trends and norms, to how music can transform communities and unite people.